Unfortunately, new fences don't stay looking new for very long. A new fence will begin to fade within three months of putting it up. Your fence will begin to gray within a year. They also attract mold, mildew and water deposits from whatever moisture happens to be pounding on them. Before you know it you look outside and your beautiful fence has turned to gray and has sprinkler damage all over it. Well, no need to worry. In most cases we can clean your fence to a like new condition and stain it so it looks as beautiful as the day it was installed. Our cleaning process is very inexpensive and prepares the wood for staining which needs to be done to replace the essential oils your fence needs so badly to protect itself from the harsh Panhandle elements. 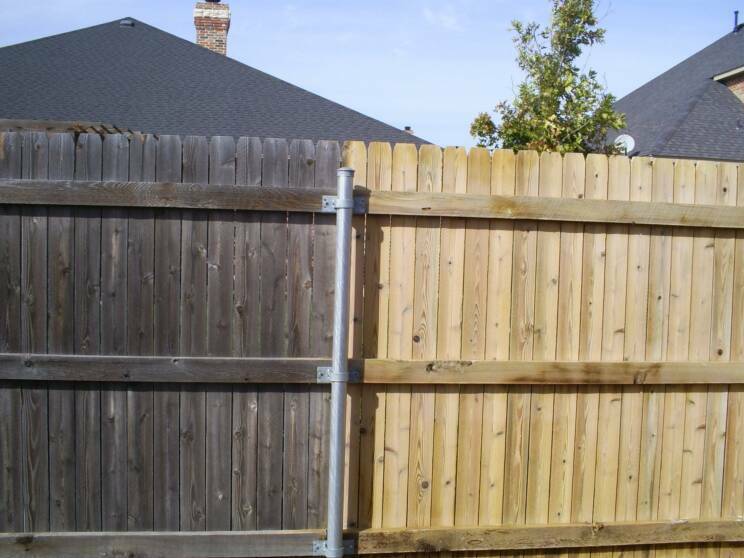 If left alone your fence will surely begin to gray and deteriorate in a matter of months. Staining your fence will add beauty, value and protection to your investment. We use only the best oil-based stains on the market. Our stains have a built in mildewside to inhibit the mold and mildew that turn a beautiful new fence gray. It also contains over %90 UV protection to slow the fading process. As well as all the essential oils that your fence needs to stay looking healthy and repel water.